The euro is sucking wind! It’s down a whopping 18% against the U.S. dollar since May of last year. And once the European Central Bank’s (ECB) stimulus package was announced last Thursday, it only intensified the selling, and the euro dropped another 3% in the wake of the news. But my analysis shows the euro is poised to bounce. I’ll be clear: I’m not recommending you go out and buy euros, or bullish euro positions. We think the long-term trend of dollar strength and euro weakness will persist throughout 2015. But don’t be surprised to see a bounce higher in the euro over the next couple of months. Intermarket analysis is a form of technical analysis that focuses on relationships between various market prices. Often, when a logical and persistent relationship between two markets is discovered, it can be used as a predictive tool for forecasting future price movements of related markets. Germany is clearly the stalwart of the euro zone economy and, thus, the euro currency. So when investors are bullish on the prospects of the German economy and German companies, they’re also bullish on the euro. Likewise, when investors worry about Germany’s ability to carry the burden of Greece’s struggles, for example, they’re bearish German stocks and bearish the euro – it’s the same thesis, essentially. In blue, I’ve plotted historical prices of the CurrencyShares Euro Trust ETF (NYSE: FXE). In green, I’ve plotted a “Germany-to-U.S.” ratio (EWG:SPY). When this ratio rises, German stocks (EWG) are outperforming U.S. stocks (SPY), and vice versa. In theory, a rising Germany-to-U.S. ratio indicates investors are relatively more bullish on Germany than the U.S., and, thus, more bullish the euro than the dollar. The euro peaked in May of last year, but there were signs that the Germany-to-U.S. ratio was turning lower months before. Specifically, the EWG-to-SPY ratio made a triple top formation in January and February, it dropped sharply lower in March, and then it made a lower high in April — all bearish signs suggesting investors’ appetite for German stocks was waning. That made the EWG-to-SPY ratio a nice leading indicator of the euro’s next move. 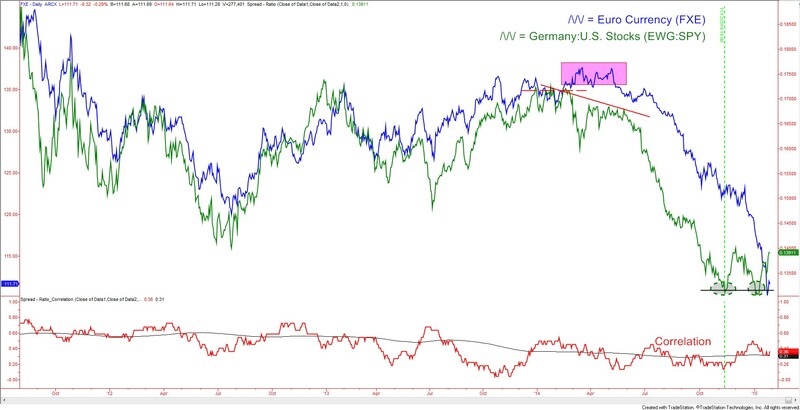 Currently, I see another potentially profitable divergence setting up… whereby the Germany-to-U.S. ratio has stopped falling, makes a double bottom formation, and begins trending higher (all bullish signs). Meanwhile, the euro currency continues to fall during this timeframe. Since the EWG-to-SPY ratio made the turn lower months before the euro, in 2014, I’m watching for the same pattern to unfold now. If German stocks maintain strength in the near term, we’ll likely see the euro get a boost within a couple of months. Again, this isn’t an unqualified “buy the euro” recommendation. Don’t do that! However, I will be identifying ways to capitalize on this relationship with specific recommendations in both Boom & Bust and my trading service, Cycle 9 Alert.